Here’s another formative freebie that’s iPad-friendly! 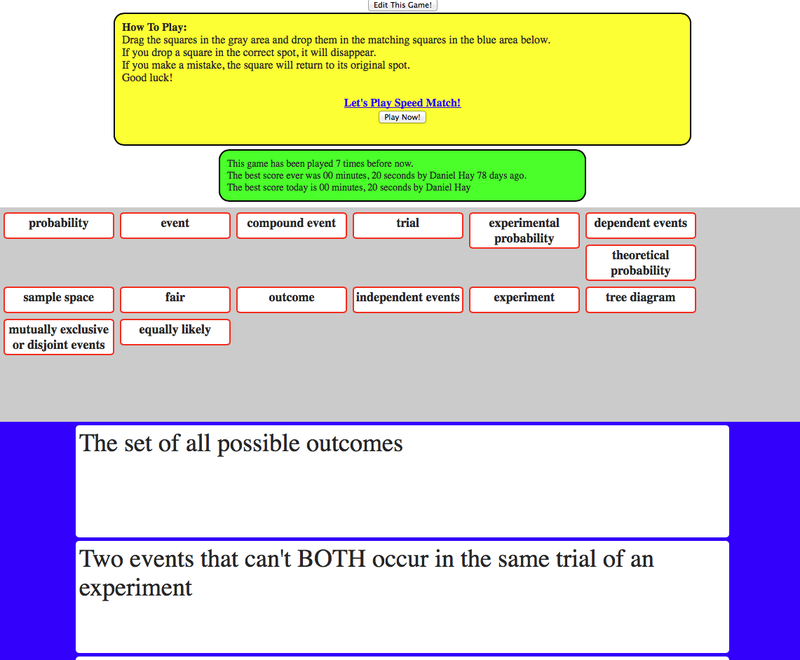 I recently used the Speed Match on SuperTeacherTools.net to review probability vocabulary with my students. I remember the days of using Speed Match on a SmartBoard, allowing only one student to play at a time at the front of the class… now the Speed Match works on iPads so every student can play simultaneously. The best score of all time and the best score of the day are posted, so students love playing again and again to attempt to beat the record. What is a Speed Match? It is what it says it is – a matching game based on speed. Content can be anything where matching is appropriate, but for math, vocabulary is a fitting source. Vocabulary terms float above definitions, and the player drags the matching term to the definition at the top of the stack. If the term matches the definition, a new definition rises to the top of the stack. Rinse and repeat! A Speed Match quiz is simple to create – type words and their respective definitions into the web-based template, and leave the rest to Super Teacher Tools. One can also search quizzes that others have created, but they are only organized by the date they were created, not the content. Click around and you might find something you like. Here’s the quiz my students played repeatedly. The stats that show up are completely wrong, however, as all of my students played (not just 7) and it was barely a week ago (not 77 days ago… hmmm!) The important parts, however, (the fastest time and the bearer of that time) are indeed accurate. I added this new link to a Probability ThingLink I had created previously, which already included vocabulary. 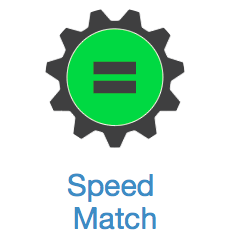 That way, students could explore the ThingLink before playing the SpeedMatch to improve their speed… and reinforce the terms, which is the goal all along! Note the Speed Match link is the target at the center of the spinner. Our Math PLC plans to create Speed Match quizzes for every unit of study next year, to serve as one more support for academic vocabulary. Likewise, our classes can compete against each other! I wish the leaderboard included more names than just the fastest student – it would probably motivate kids to know that more than one student had a chance to earn that kind of recognition. Note – many of the tools on the Super Teacher Tools site are still flash-based. This entry was posted in Algebra 1, Pre-Algebra and tagged Algebra, anchoring activity, assessment, formative, iPad, Pre-Algebra, review, superteachertools, vocabulary. Bookmark the permalink.